Pass on expensive payment provider fees to customers - choose to add a fixed fee, percentage surcharge or combination. Or encourage customers to use cost-effective payment options by offering a discount for these payment methods. Need to add a small order fee surcharge? Check out the Fooman Small Order Fee extension. What kind of payment surcharges can I add with this extension? You can add as many different surcharges as you like based on your store's payment methods - including credit cards, Paypal, Stripe, bank transfer, check, Afterpay and more. You can't yet add different surcharges for different credit card types (e.g. 5% for AMEX but only 3% for Visa/Mastercard). This feature is on our roadmap for future development. 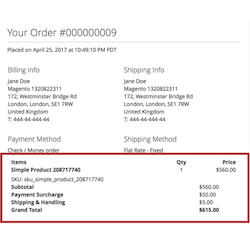 Based on our experience with Magento 1 and surcharges, certain custom payment methods (those which send cart contents but do not honour Magento custom totals like surcharges) may not be compatible with Fooman Payment Surcharge. Our extensions include a 30 day money back guarantee, so feel free to test out the extension with any custom payment method if you suspect it may not not honour Magento custom totals. Am I permitted to charge a surcharge for credit card payments? Please check your individual credit card contractual agreement, as it varies from country to country and from payment provider to payment provider. As an alternative to charging a surcharge on credit card payments, you can usually apply a discount to non credit card payments (eg. cash payment/bank transfer). Will Fooman Payment Surcharge work with my one step checkout? How many different payment method surcharges can I set up? As many as you want to - there's no limit.